ASTConsumer - This is an abstract interface that should be implemented by clients that read ASTs. This abstraction layer allows the client to be independent of the AST producer (e.g. parser vs AST dump file reader, etc). Definition at line 33 of file ASTConsumer.h. Definition at line 41 of file ASTConsumer.h. Definition at line 43 of file ASTConsumer.h. Reimplemented in clang::BackendConsumer, and clang::MultiplexConsumer. Definition at line 107 of file ASTConsumer.h. Definition at line 103 of file ASTConsumer.h. If the consumer is interested in entities being deserialized from AST files, it should return a pointer to a ASTDeserializationListener here. Reimplemented in clang::PCHGenerator, and clang::MultiplexConsumer. Definition at line 127 of file ASTConsumer.h. If the consumer is interested in entities getting modified after their initial creation, it should return a pointer to an ASTMutationListener here. Definition at line 123 of file ASTConsumer.h. Invoked when a function is implicitly instantiated. Note that at this point point it does not have a body, its body is instantiated at the end of the translation unit and passed to HandleTopLevelDecl. Definition at line 82 of file ASTConsumer.h. Definition at line 111 of file ASTConsumer.h. Handle an ImportDecl that was implicitly created due to an inclusion directive. The default implementation passes it to HandleTopLevelDecl. Definition at line 28 of file ASTConsumer.cpp. Definition at line 57 of file ASTConsumer.h. Definition at line 22 of file ASTConsumer.cpp. 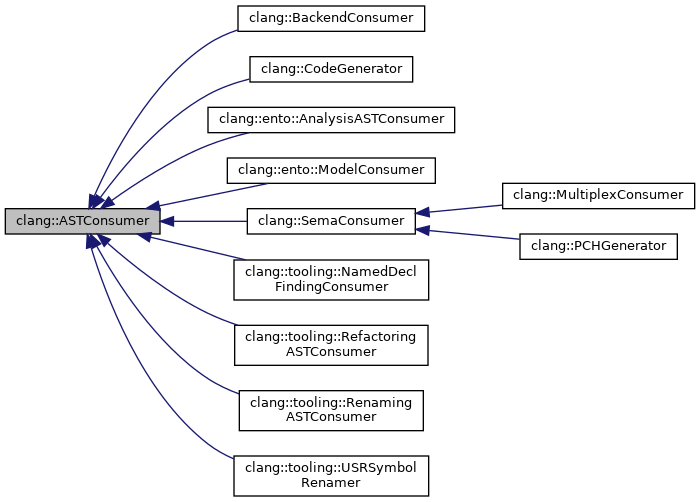 Referenced by HandleInlineFunctionDefinition(), and PassObjCImplDeclToConsumer(). Definition at line 72 of file ASTConsumer.h. Definition at line 76 of file ASTConsumer.h. Reimplemented in clang::BackendConsumer, clang::MultiplexConsumer, and clang::ento::ModelConsumer. Definition at line 18 of file ASTConsumer.cpp. Referenced by clang::Sema::ActOnPragmaDetectMismatch(), clang::Sema::ActOnPragmaMSComment(), clang::ASTMergeAction::ExecuteAction(), HandleImplicitImportDecl(), HandleInterestingDecl(), clang::Sema::InstantiateClassMembers(), and ReferenceDllExportedMembers(). Handle the specified top-level declaration that occurred inside and ObjC container. The default implementation ignored them. Definition at line 26 of file ASTConsumer.cpp. Reimplemented in clang::PCHGenerator, clang::tooling::USRSymbolRenamer, clang::BackendConsumer, clang::tooling::RenamingASTConsumer, clang::MultiplexConsumer, and clang::tooling::RefactoringASTConsumer. Definition at line 66 of file ASTConsumer.h. Definition at line 118 of file ASTConsumer.h. Definition at line 47 of file ASTConsumer.h. Referenced by clang::CompilerInstance::setASTConsumer(), and clang::CompilerInstance::setASTContext(). PrintStats - If desired, print any statistics. Definition at line 132 of file ASTConsumer.h. This callback is called for each function if the Parser was initialized with SkipFunctionBodies set to true. true if the function's body should be skipped. The function body may be parsed anyway if it is needed (for instance, if it contains the code completion point or is constexpr). Definition at line 140 of file ASTConsumer.h. Definition at line 38 of file ASTConsumer.h.